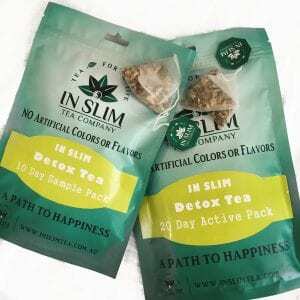 IN SLIM Detox Tea helps you to lose weight naturally by increasing your metabolism, aiding with digestion and helps your body to convert food into energy. It burns fat and calories whilst suppressing your appetite. It not only contains the powerful Garcinia Cambogia, but also high quality lotus leaves and green tea etc. For the benefits of main ingredients, please refer to the individual product page for details. 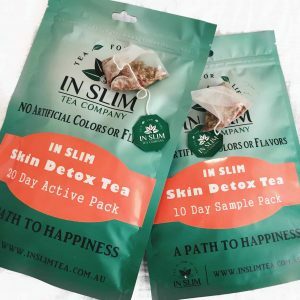 In Slim Tea Co. has specifically formulated this tea blend to assist you in achieving your weight-loss goals and help lower your cholesterol, reduce excess water retention whilst cleansing your liver and kidneys. The good news is our IN SLIM Detox Tea does NOT contain harsh laxative like senna leaf which is widely used in the market. We do NOT believe in using strong laxatives to achieve our goal as it may have reverse effect to the body. We believe in embracing healthy diet and drinks to help us build a healthy and strong body, and embracing TEA in your daily life is definitely a great and imperative start. Our teas are suitable for all age and gender groups, whether you are a young adult who regularly eat unhealthy fried food wanting to get rid of the nasty toxins, or you are a mid-age professional who regularly sleeps late and under lots of stress, or someone who sometimes over-indulge with the alcohol, or someone who simply wants a cleaner and healthier body! 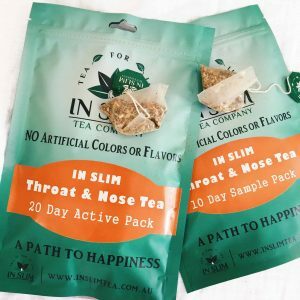 For the best weight loss result, we strongly recommend you to drink this tea in conjunction with our IN SLIM Fat Burning Tea, so the detoxing and fat burning can magically happen at the same time! In order to be cost effective, check out our Weight Loss Essential Pack! Garcinia cambogia is one of the hottest weight loss fruit being discussed today. It is a small and bitter tasting fruit came from a tropical tree that is cultivated for culinary purposes in Indonesia, South Asia, India and Africa. Its extract is used for various treatments in Ayurvedic medicine including weight loss, stomach ulcers and digestive problems. Hydroxycitric acid (HCA), a citric acid byproduct, is the main active ingredient in Garcinia cambogia. HCA blocks fat by inhibiting the efforts of an important metabolic enzyme. This is one of the reasons that why Garcinia is so successful as a weight loss supplement. What makes Garcinia Cambogia stand out from hundreds of other natural weight loss boosters is its dual action to both help control the appetite and prevent fat from being formed and stored in the body. This blend also contains the powerful slimming ingredient lotus leaves. The results from a modern medicine study showed that the leaves have a cholesterol-lowering effect. The decoction from lotus leaf can be used to treat hyperlipidemia. After a 20 day course, the success rate of lowering cholesterol level among participants is up to 91.3%, of which 37.8% were improved significantly (baidu.com, 2013). Nuciferine is an alkaloid extracted from the lotus leaves, which can lower blood pressure. And due to such effect, it is commonly used to treat obesity. The weight loss principle behind the Nuciferine is that it forms a layer as a barrier inside your intestinal to effectively prevent the absorption of fat and fundamentally help with weight loss and prevent the rebound (baidu.com, 2013). As it contains all the natural ingredients with no artificial color and flavors, so it has all the original taste! It does have a slight bitter taste because of the Garcinia cambogia! You will also enjoy a refreshing taste thanks to the lotus leaves. Add a bit of honey to adjust the taste if desired. Drink 30 minutes before meal. Each tea bag has 3g, which is more grams/stronger than usual! As its high strength, each tea bag can be and should be used twice. The brewing instructions can be found in the Our Product page and the back of the packaging. In order to achieve the result you desire, it is recommended to start with AT LEAST TWO COURSES (2 x 20-Day Active Packs). When you finish one course, we recommend you to stop and have a 10 days break (or whatever left for the month), then start the next pack at the beginning of the next month. For the best result, please drink this tea in conjunction with our IN SLIM Fat Burning Tea. 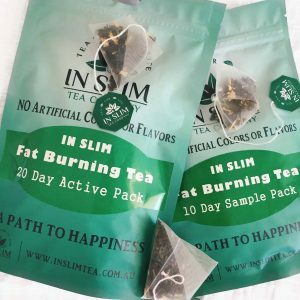 IN SLIM Fat Burning Tea is a super effective weight loss tea itself which can be drunk together with the IN SLIM Detox Tea or alone. We HIGHLY RECOMMEND you to drink it at least twice a day during the whole course of your detox routine to speed up your weight loss process.